making his way through rain, hail and snow with his instrument strapped to his back. Felipe Gomez calls himself a “modern troubadour”, and rightly so, as there is something quite romantic and old-world about his whole adventure. In this interview, Felipe tells us all about what inspired him to take his music on the road. How did the Bike and Bass Tour begin? I wanted to have a more adventurous life, to see the world and play music. What do you love about bike touring? I love that every day is different. Often people, animals and landscapes that are the most unexpected, but Mother Nature also keeps me on my toes. One day it might be snowing heavily, or a freezing -20 degree celsius day, while other days are relaxing and you can take your time. Then there are those truly unexpected moments, when you are worried about that grizzly bear you just saw around the corner. Tell me about playing the bass. When I was around 16 years old, my brother brought home a Metallica cassette tape — after that I knew I wanted to be a musician. I decided to become a solo bass player because I wanted to be able to travel and entertain people. I just felt like it was something I was meant to do. The way I see it, the music and the stories are a part of me and the bass is an expression of my soul. But I have to say, when I am dragging on the bike, and my knees start hurting, I really wish I played the harmonica instead. 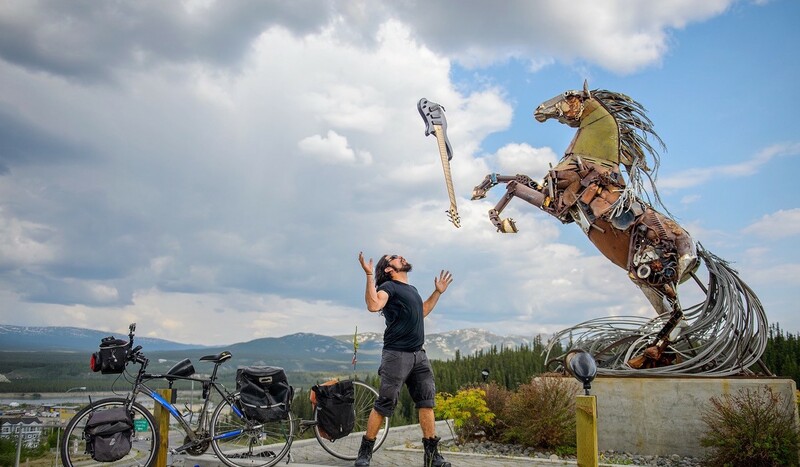 So what made you decide to hit the road with the Bike & Bass tour? I wanted to visit those communities that don’t get many visitors or much art passing through. I also wanted to inspire people to explore Canada, experience the outdoors, and embrace the wide diversity of art, cultures, landscapes and wildlife that it has to offer. As for what I get out of it, the people that I meet on the tour are a constant reminder to me that the world is full of good people. What music do you listen to when riding? I’ve been loving Xavier Rudd recently. You make a living out of inspiring other people. Who inspires you? Anyone that is trying to leave a legacy on this world, people who are creating art and trying to help others. What are the biggest challenges you’ve faced while on the road? It’s a combination of landscapes, weather and isolation, but the biggest challenge is the cold. 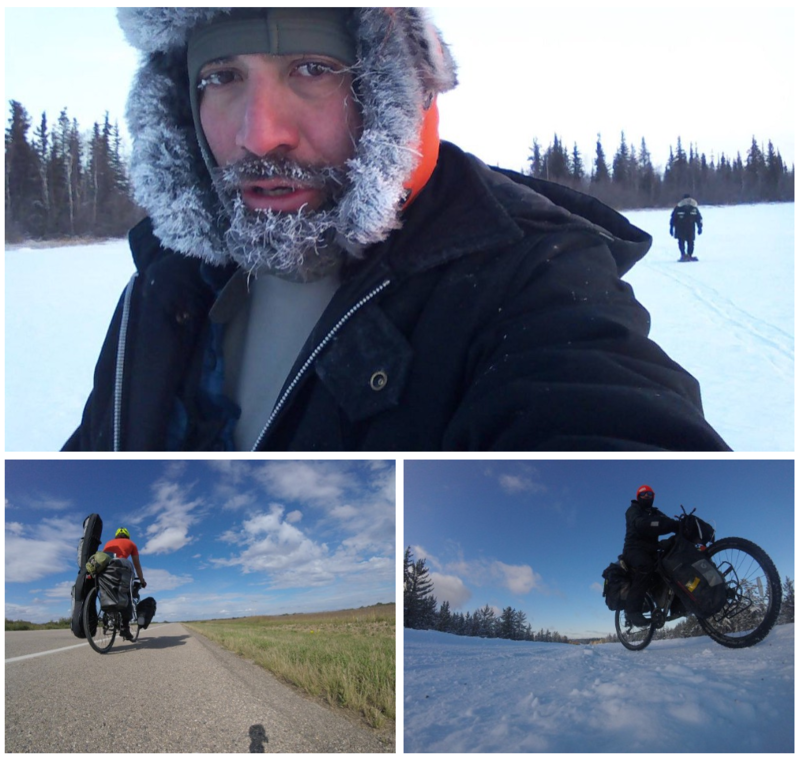 On my most recent tour, I was facing temperatures of -35 degrees celsius. It really makes you aware of every part of your body, and your only priority becomes how to keep warm. What’s the most unexpected thing that’s happened to you on your travels? Often animals, including encounters with grizzly bears and wolves. When I was riding the Dempster Highway, I came across 8 bears in 11 days. The last one I saw decided to be more curious that the rest, and approached me while I was sitting on the side of the road. I had to use bear bangers to try and scare him off before jumping on my bike and riding away as fast as possible. On my last tour in North Saskatchewan, I ran into several wolves, and unfortunately they are used to the sound of bear bangers because that’s what the local mine sites use to scare them away. After using bear bangers with this one particular wolf, and not scaring it at all, I really started to lose my patience — all I wanted to do was set up camp, make a fire, have some tea and get in my warm sleeping bag. So I just started pedalling towards the wolf barking. Luckily, it worked. On a more positive note, I think the unexpected thing I love the most is the people you meet along the way. After all, you can plan maps, routes and food, but you can’t plan who you are going to meet. Is there anything you have to sacrifice while travelling? Family life is the hardest thing to leave behind. For someone who wants to get out on the road as you do, what’s your top tip for bike touring? You can’t get mad at Mother Nature — if she throws a blizzard at you, and you have to stay in your tent for 4 days, that’s just the way it is. And if that happens, just make sure you have a good selection of books with you. When I was stuck in my tent, I read two books, Into The Wild and Into The Thin Air. Come to think of it though, they weren’t the best choices when both books were about people being killed by the elements and starvation. Are there any other important lessons you’ve learnt along the way? Don’t assume anything. Just because there is a small village plotted on your map, it doesn’t mean that village actually still there. I learned this the hard way. Also, make sure you talk to locals and listen to what they have to say. What should every bike tourist pack in their baggage? Music, on any kind of device. What do you love about Canada, and why should people visit? Canada is one of the last remaining places where you can still have a “human versus nature” experience. Where’s somewhere in Canada that not too many tourists would have heard of, but is must-see? Most of where I travel in Canada is far away from any tourist trap — back roads are my favourite, and seeing as Canada is the second biggest country in the world, there are plenty of them to explore. Any arctic adventure is also at the top of my list and North Saskatchewan is definitely worth visiting. Why do you think it’s important for people to get out of their comfort zone? I am leaving this month for a North Manitoba tour — I was invited to perform at the Indigenous Music Awards, in Winnipeg. 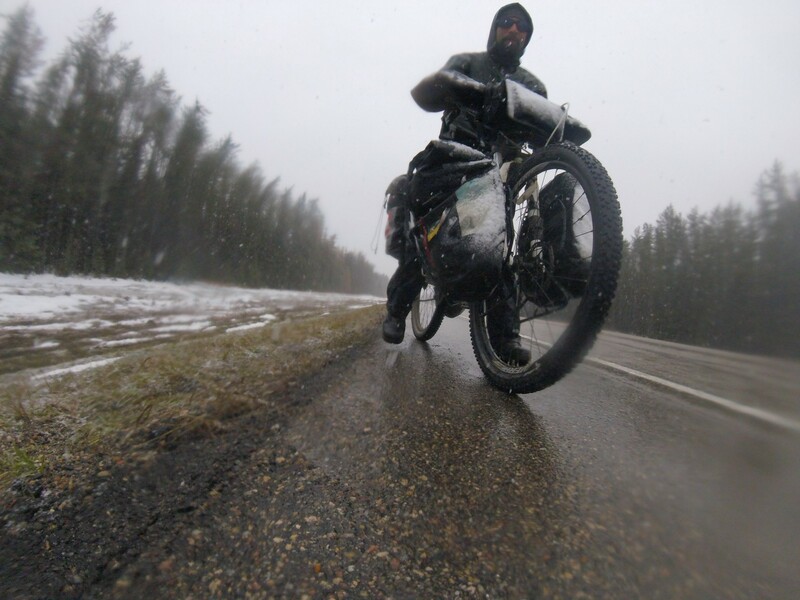 The ride will be about a month long, and as it will be Spring I’m expecting really wet snow, skinny black bears that are just waking up from hibernation, and hopefully not too many mosquitos. I’m really looking forward to sharing my music and stories with the local communities, and whatever unknown adventures are ahead. 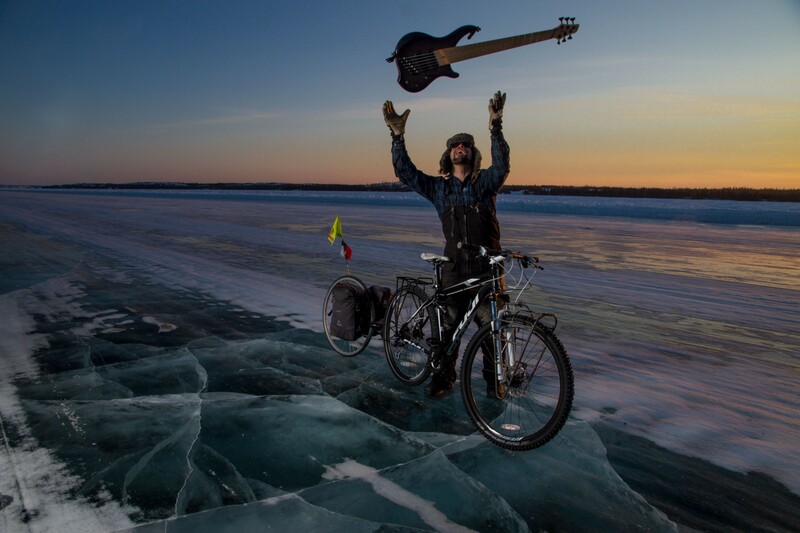 Explore Felipe’s cycling route through West Canada by clicking through the map above. You can follow Felipe and all his biking adventures on his website, Facebook, Twitter, Instagram and YouTube. 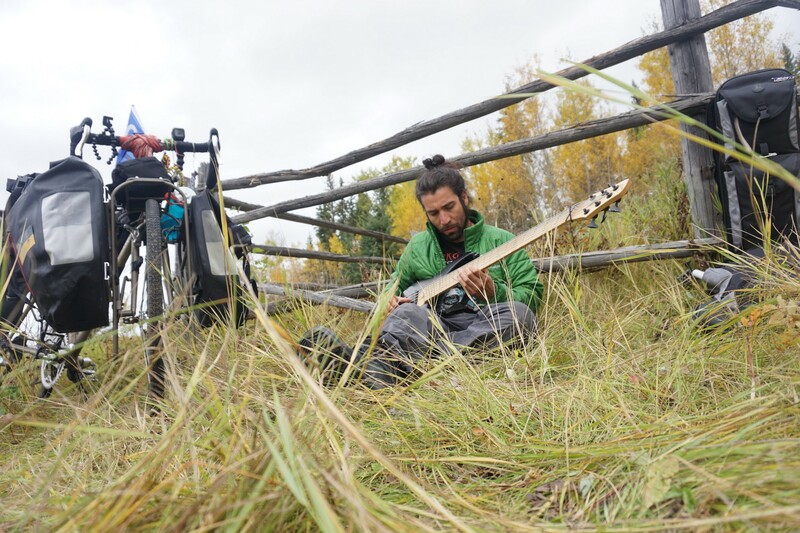 The Bike and Bass Tour uses Alpaca to plan and plot its musical adventures. Want to create a shareable map of your own cycling tours? Get started today. The Bike & Bass Tour was originally published in alpaca.travel on Medium, where people are continuing the conversation by highlighting and responding to this story.